I’ve hopped on “the bandwagon” and started a Bullet Journal. Someone I know mentioned this lovely little system on a Facebook group I’m a part of, and I was intrigued. I love journals! I love planners! 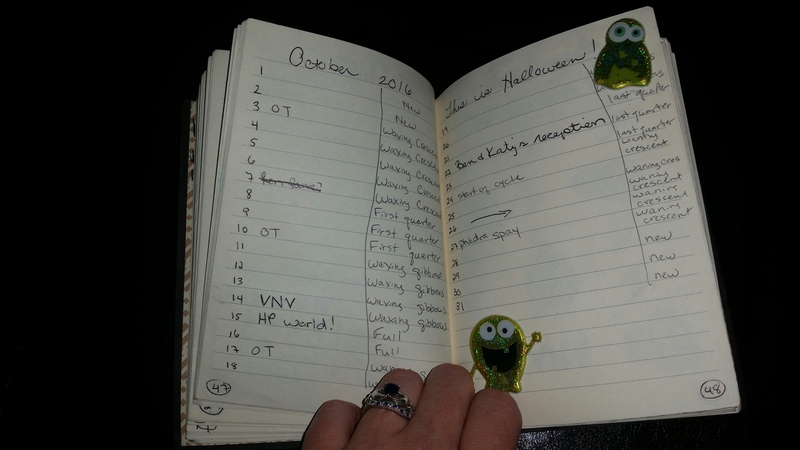 I love keeping track of my time using fun, tried and true methods! SIGN ME UP! I have a mild obsession with planners, notebooks, school supplies…I thrill over new pens and markers, I swoon at the scent of new colored pencils, and notebooks? Give me ALL of them! I made the mistake of doing a quick google/Pinterest search about bullet journals, (or #bujo for Instagrammers)and was immediately overwhelmed. So many beautiful pictures of art, doodles, trackers, spreads, layouts! It was inspiring, but a little frightening at the same time. I’m not artistic. Do I need to be artistic to do this? The good news? Nope! 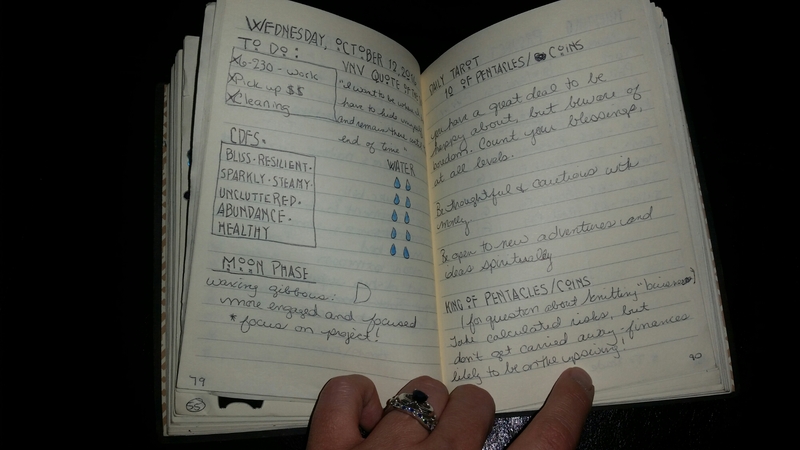 You don’t need to have an artistic bone in your body to be a successful bullet journaler! I watched this handy dandy video, which set my mind at ease. 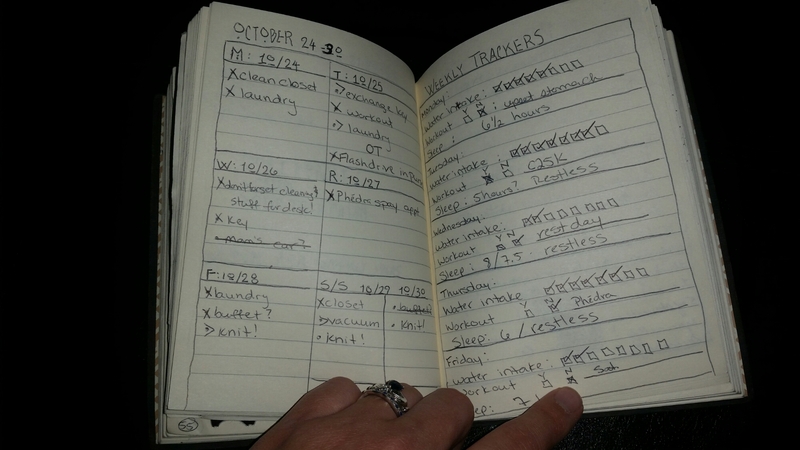 The actual process for bullet journaling is SO easy, simple,and minimal! I hope you’ll watch the video, but you basically have monthly, weekly, and daily “logs” where you record tasks, events, and notes. 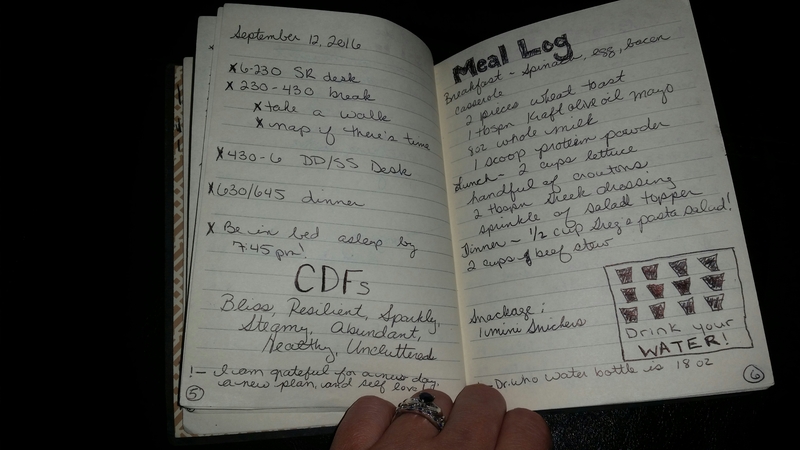 Bullet Journaling, like so many things, has taken off all over the world. The awesome thing about it is, its completely open to interpretation and expression. I’ve modified the set up several times now. I’ve been using this system for 3 months, and its very helpful in making sure that I take care of things that I tend to forget about. I’m still working out which layout is best for me. I felt that daily logs weren’t beneficial, because I’m honestly not all that busy, but at the moment, weeklies are feeling very small, and like I don’t have enough space for everything that I want to log. I may have to find a happy medium. And a bigger notebook! That’s the other amazing thing about this system. Unlike other planners you have to order and wait for, you can use literally ANY notebook for this! Of course, the Bullet Journal website sells notebooks specially designed for this system. The many Facebook groups I’m a part of (seriously, I’m in 3 or 4 groups JUST for people who Bullet Journal!) tend to recommend Leuchtturm, or Moleskine notebooks. Some people recommend just a standard Composition Notebook. Me? Right now, I’m using this beautiful journal that was gifted to me last Christmas. This particular journal feels too small for me, but its definitely getting the job done. The answers, for me, were simple. 1. I don’t have access to my phone all the time. In fact, the majority of my day, I cannot take my phone out. At work, I only get to have my phone out during breaks and lunch. Plus, I really want to start unplugging more. I feel like I’m attached to my phone when I’m out, and I don’t like that. I don’t want to add one more thing to the list of reasons why I NEED my phone. 2. I’ve never had much luck getting my calendars to work on my phones anyway: reminders don’t occur, or the events just don’t save. 3. I always have pens with me anyway, and have you SEEN my purse? That thing is a bottomless pit of doom. Carrying one notebook is definitely not going to make a difference in how heavy it is! Plus, this way, I don’t have random post-it notes floating around my purse anymore. I love the freedom I feel with this system. 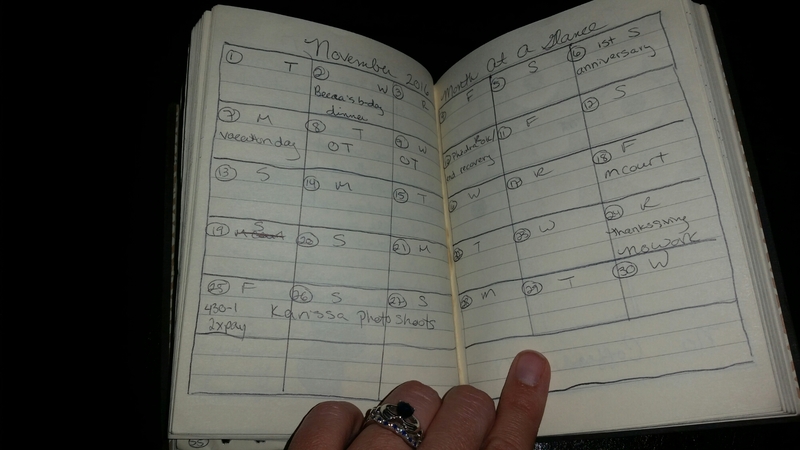 I can keep track of my work schedule, what days I’m working overtime, when my husband has gigs and court dates, etc. 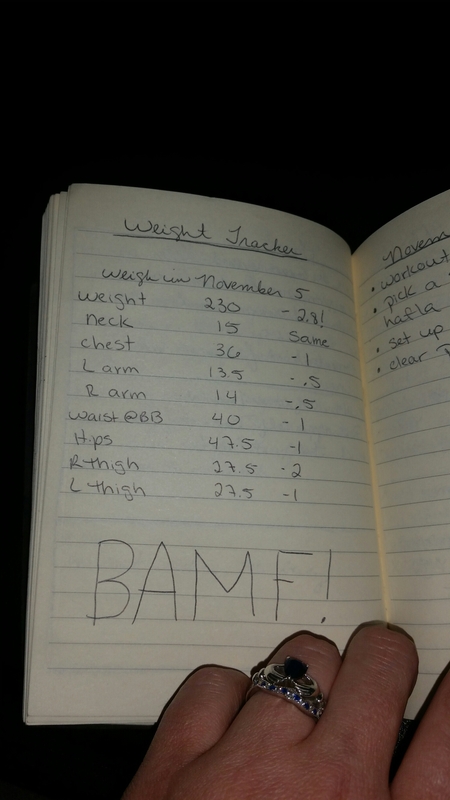 Plus, like many bujo users, I also use mine to keep track of other things like water intake, workouts, knitting projects, and my weight loss! I’ve also done two monthly challenges that I track as well. 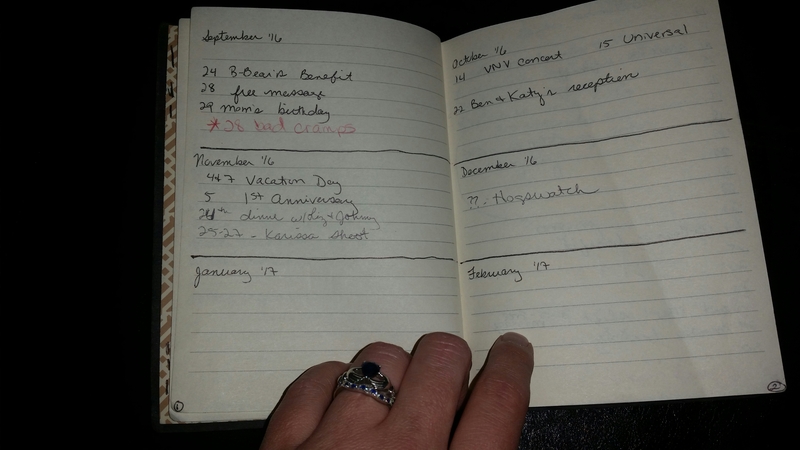 I’ve added a few pictures below, so that you can see the progress I’ve made in my bullet journal. 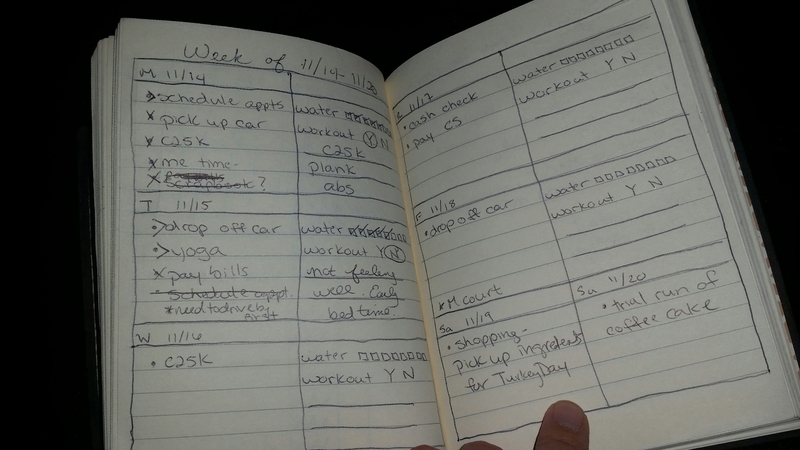 You can see that I’ve gone from daily logs to a more weekly approach, at least for now, and how things are working for me. 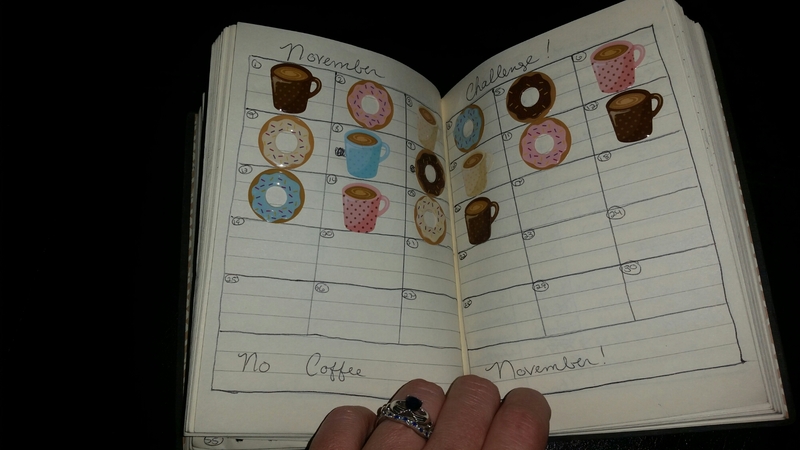 I’ve also included pictures of my tracker pages and challenge pages: my “No Candy October Challenge” spread, and “No Coffee November” spread. 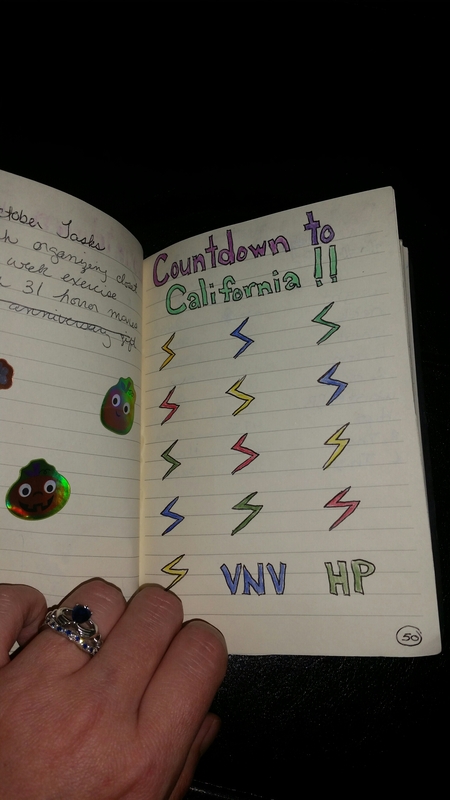 I had a Countdown to California page where I was able to count down the days before our trip to see our favorite band and go to Universal Studios. And finally, the spread keeping track of my knitting progress on 6 projects I’m working on. If you are artistic, you can decorate, draw, washi tape, etc to your heart’s content. That’s the beauty of this system. It can be tailored to your liking! I’ll leave you with the photos. If you have questions, let me know! Check out Instagram and Pinterest for some awesome ideas! please excuse my sloppy handwriting. This is what my first two monthly spreads looked like. Simple. This is the new monthly layout I’m trying. This was the first daily layout i used. Slightly different daily. Had some fun trying out a “hand”: the American Horror Story font/hand! Daily spreads were a little too much, so i moved to a weekly. 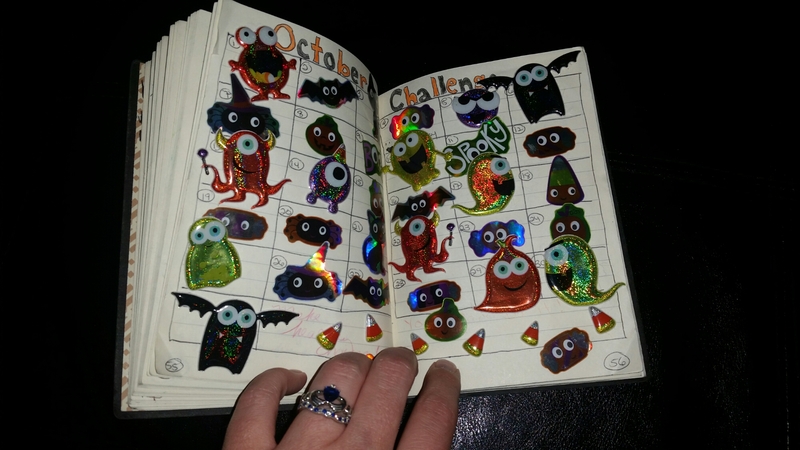 October’s Challenge: a sticker for every day I didn’t have a candy bar.